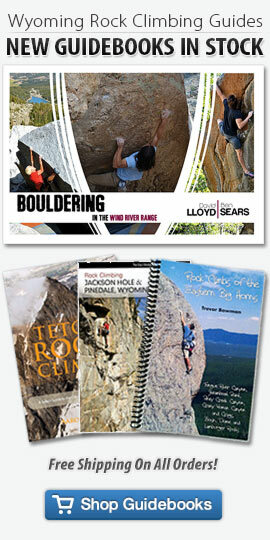 Guidebook Supplement Material // Posts tagged as "Guidebook Supplement Material"
A classic boulder problem can turn you mad, to the point that you keep going back. In the summer of 2014, I explored some poorly documented boulders. I soon found myself driving there weekly from Jackson, Wyoming. I drove alone and sometimes with friends, regardless I always got beat up and had a fun time doing it. Welcome to Badger Creek Bouldering. "Knockin’ on the Sky" is a classic new 4-pitch mixed 5.12a at Rock Springs Buttress at Jackson Hole Mountain Resort in Wyoming. The climbing is made up of a mixture of well-protected sport with intermittent sections of moderate cracks. The route’s second-pitch crux is the obvious prize but all pitches are classic! A long, memorable, and safe route – a worthy challenge for capable teams. Checkout route photos and beta. Get inspired, then go send! Download the free mini-guide to Scab Creek Buttress, a 400-foot granite crag with a complement of moderately rated multi-pitch traditional routes near Boulder, Wyoming. Most of these routes offer great protection and easy route finding. Scab Creek is sure to inspire dedicated climbers to venture higher into the Wind River Mountains. Download a free mini-guide and take a climbing field to a new granite bouldering mecca near Boulder, Wyoming called The Galaxy. This up-and-coming area is every boulderer's dream playground - there are literally hundreds of easily accessible, and densely concentrated boulders within a one-to-fifteen minute approach. Death has its own itinerary, listens to nobody, and leaves no one behind.